Carol and Les were lovely. Their basket of fresh fruits from their backyard was onolicious! Lots of great resources in the room - used her binder to find one of the best meals on the trip (Hukilau Lanai) and borrowed her trails book to find the 'Awa'awapuhi trail. Mahalo for such a beautiful space! The warm hospitality and the beautiful gardens make for an unforgettable stay. The fresh fruit was wonderful and the room super comfortable. The property is so beautiful and way bigger than we had thought based on the pictures. Definitely would stay here again!!! The owners are so friendly and had great recommendations for places to go. Close to the airport, beach and shopping. Great location! The room was wonderful! The surrounding garden was spectacular! The hosts were so helpful and gracious! I would HIGHLY recommend "The Secret Garden"It was also a convenient location to beaches and towns. Beautiful garden -- perfectly manicured. Les was very knowledgeable about gardening and happy to talk about it. Fresh local fruit was a much appreciated extra. Hosts very friendly and anxious to please guests. This is a lovely quiet location with a beautiful and lush private garden. The hosts are most welcoming and helpful (and offered us fresh fruit each day). The location is inland (the nearest town is Kapa'a), but extremely convenient for going up or down the island. Our hosts could not have been more pleasant or accommodating! We loved the basket of fruit and overall setting! The beautiful garden and koi pond greeted us each morning and put smiles on our faces. The fresh Hawaiian fruit and coffee were two of many kind thoughtful touches provided. This accommodation was the high-light of our vacation ! Lock in a great price for The Secret Garden Room – rated 9.8 by recent guests! One of our best sellers in Kapaa! 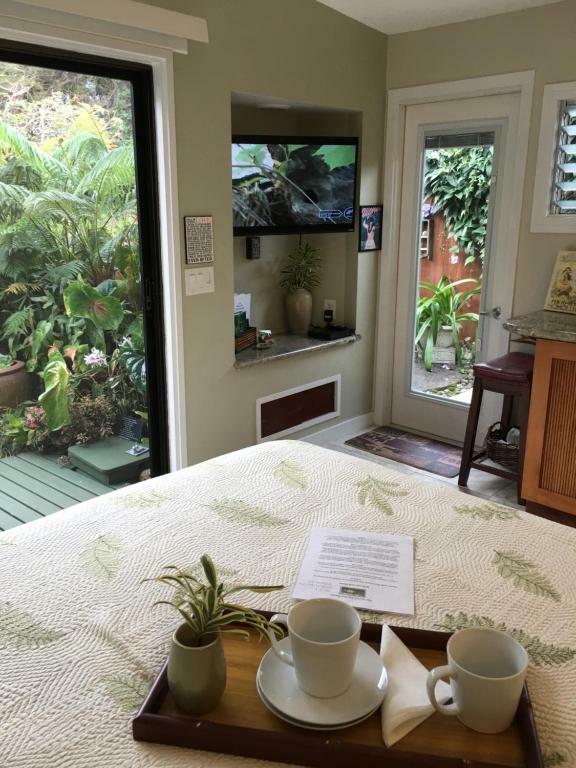 Featuring koi pond and waterfall, this Kapaa (Kauai, Hawaii) studio welcomes guests with a basket of food items and free Wi-Fi. Smith’s Tropical Paradise, a 30-acre botanical garden is 3.7 mi away. Featuring indoor and outdoor dining areas, this studio with a garden view is accessed by a private entrance. BBQ facilities, a microwave and a refrigerator are also provided at The Secret Garden Room. A flat-screen cable TV, a DVD player and a seating area are also featured. Dove gear, beach chairs and towels are offered for guest use. A sun terrace with a table and chairs is onsite. 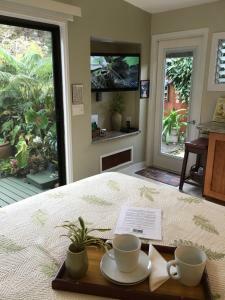 Table tennis and laundry facilities are at The Secret Garden Room Kapaa. Opaeka'a Falls is 5 minutes’ drive away from The Secret Garden Room. Lydgate State Park is 10 minutes’ drive away. 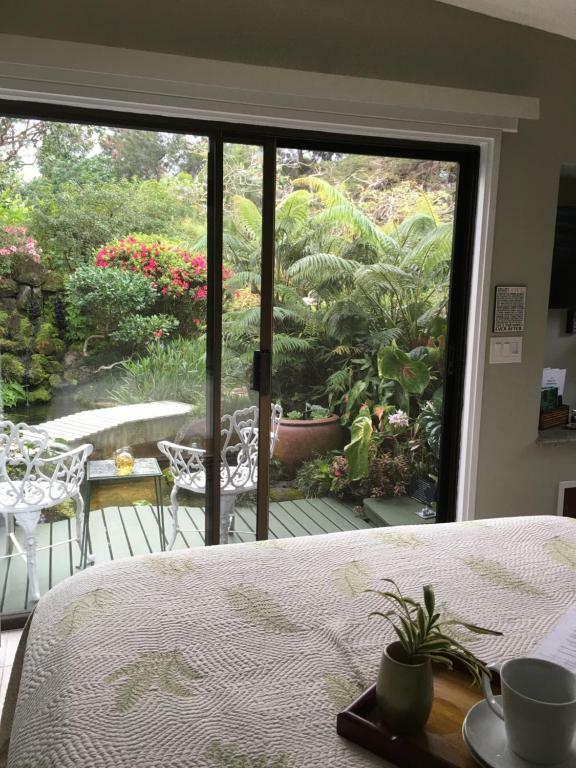 This property also has one of the top-rated locations in Kapaa! Guests are happier about it compared to other properties in the area. When would you like to stay at The Secret Garden Room? This studio offers free parking, private entrance, free WiFi, and free washer and dryer use. There is a flat screen cable TV with built in CD player and movies offered. Overhead fan, stand up shower with decorative glass door, small refrigerator, microwave, coffee maker, toaster, hotplate, pots, pans, silverware and dishes for cooking, outdoor BBQ grill and areas to sit inside and outside. Snorkel gear, beach towels and chairs, picnic cooler and wine carrier are all available. House Rules The Secret Garden Room takes special requests – add in the next step! The Secret Garden Room accepts these cards and reserves the right to temporarily hold an amount prior to arrival. Please note: The Secret Garden Room will contact you with check-in procedures. Please note: The service fee includes final departure cleaning fee and credit card transaction fee. Please inform The Secret Garden Room of your expected arrival time in advance. You can use the Special Requests box when booking, or contact the property directly using the contact details in your confirmation. The secret garden is a stunning tranquil place . The room was immaculate and the hosts carol and les were fantastic . A few small roaches here and there but I grew up in Kalihi. I killed them all! We had a really wonderful stay, everything was perfect! As the name implies, the room faces a garden. We were not prepared for the Koi pond or the rest of the garden. This is a serious expression of beauty that comes only from nature. We have visited botanical gardens all over the world but never felt we part of the garden. As for our hosts they were just great. Friendly, knowledgeable about the local flora and fauna, helpful in finding our way around. Scenic view, perfect hosts and an outstanding hospitality! Everything was really clean, lots of little details and very modern! We‘d come back anytime. Fresh fruit that carol put in the fridge! We had a wonderful time!! The room is very cozy and lovingly decorated. Carol and Les were so welcoming, we felt immediately at home. We especially loved the fruit basket!! Dear Carol and Les, Thank you for letting us enjoy this little gem. The room and garden are bigger than in the photos. 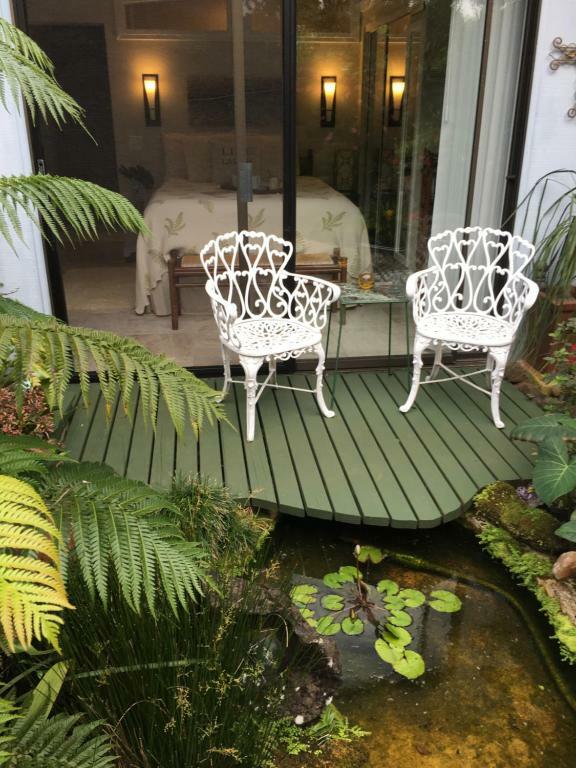 The garden and the fish pond are so peacefull and every thing we needed in the kitchen (and more) were provided. Thank you for the welcoming basket of fresh fruits and goodies. We enjoyed meeting you. We would definitly come back to the Secret garden. Mahalo! Only one trash can was provided in the room.